A fresh take on a classic, Sorella Monogram Rings blend timeless elegance with contemporary design. Whether you give one as a special gift or keep it for yourself, it's sure to be worn and loved forever - and it will always be in style. Men's and Women's styles are offered. Choose from round or octagon shapes, with block or script style lettering, in Palladium, 18k, 14k or 10k gold, and sterling silver. Or combine two metals for a striking two-tone look. Each ring carries a traditional three-letter monogram presented in traditional monogram format, with the last name initial largest and in the center. 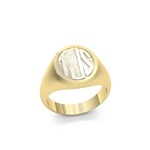 These classic monogram signet style rings makes a wonderful gift that will be worn for a lifetime.